Forget “four score and seven years ago”; until the past few years the term “STEM” wasn’t even part of our nation’s dialogue. Today, everyone’s jumping on the STEM bandwagon, but what are the real educational outcomes of this science-tech-engineering-math focus, and how will the current economic climate affect future programming? Here’s a look at STEM today, and what STEM might look like tomorrow. From political debates to classrooms to local media, the importance of STEM success is causing a buzz—so what is holding back a wholehearted push toward expanding these programs and encouraging our students to achieve their highest potential? Findings from the IESD 2012 National Survey on STEM Education of 1,079 educators suggest that concerns about funding continue to be the leading challenge. Similar to the results from the 2010 and 2011 national surveys, the 2012 survey revealed that 62.4% of STEM leaders and educators at the elementary level , 44.2% at the middle and junior high level, and 48.9% at the high school level still view K-12 funding for STEM in K-12 as inadequate. Similarly, teacher professional development—a funding priority for most STEM leaders –was perceived to be insufficient. The surveyed teachers’ top STEM tech tool was clearly the iPad, which was followed by other tablets, probes, simulation programs, and apps. Respondents noted that widespread adoption was scarce (2.7%) and few teachers anticipated that such a program would be available within the next three years (19.1%). Though security and breakage were concerns, funding affordability for all students was again the leading challenge in obtaining the needed products. Another positive development is the entrance of corporations and private and public partnerships into the STEM funding game. “Companies are saying, ‘This is really important to us and to our workforce of the future. We need students with these skills, therefore we’re willing to invest money in getting STEM teachers trained to be proficient, as well as bringing teachers in from the industry to teach STEM in the school,’” says House. The Obama administration, in response to concerns about our country’s educational performance on a global scale, has launched an “Educate to Innovate” STEM campaign. This move to shift American students from the middle of the pack to the top within the next decade will focus on increasing STEM literacy to improve critical thinking for all, engage underrepresented groups in expanded education, and create STEM career opportunities. A 2010 Report to the President by the President’s Council of Advisors on Science and Technology noted the issue was not solely preparing students for STEM-related futures, but inspiring those most qualified to take interest in those fields. Programs such as National Lab Day, Digital Media and Learning Competitions, and the White House Science Fair were implemented to add excitement and engage students. According to the IESD STEM Survey, less than half of the respondents (48.7%) indicated that their schools or districts had one or more programs that integrate core concepts of STEM, although the majority (59.8%) felt that these programs would be implemented in the next one to three years, which demonstrated an awareness and willingness to move toward improvement. While common math and language arts standards have become the norm, the standards for science learning were no more than an inconsistent stateby- state wide swath of disconnected factual requirements many felt too broad in subject and too shallow in substance. The National Research Council (NRC) of the National Academy of Sciences, with assistance from dozens of experts and a massive peer review panel, developed A Framework for K-12 Science Education to provide unifying guidance for the nation’s schools to improve all students’ understanding of science. The framework consists of scientific and engineering practices, seven crosscutting concepts (such as “cause and effect: mechanism and explanation”), and disciplinary scientific core ideas that include guidance on how and when they should be developed across grades K-12. The framework is designed to engage students and ensure they build on prior knowledge and experience throughout their school careers. In a process managed by the bipartisan, non-profit organization, Achieve, 26 states are leading the development of the 2013 Next Generation Science Standards (NGSS) based on this framework for success. A consistent set of standards will allow STEM leaders to aspire toward the more challenging goals ahead. As the STEM students of today become the STEM teachers of tomorrow, there is no limit to what this new generation of innovators can build for our future. 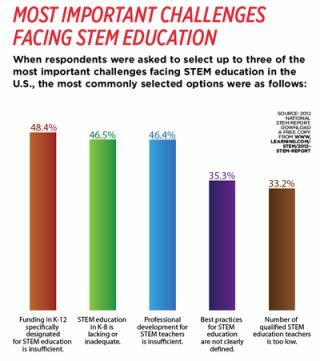 • About half of the respondents (48.7%) reported that their schools or districts had one or more programs that integrate core concepts of STEM. • Another 30.6% reported that their schools or districts were somewhat likely or very likely to integrate core concepts of STE M in the next one to three years. Solution: James Brownlow, head of the Polymers Program at Hattiesburg High School in Hattiesburg, Mississippi, uses technology (gained through winning the Vernier 30th Anniversary Grant), to allow students to test a variety of polymers for the outer shell of the helmet and many types of padding for the foam inserts. Using impact tests, they’ll determine the best combination of materials to protect players by incorporating Dual-Range Force Sensors, Force Plates and Accelerometers into the lab design. With adrenaline and plain old team spirit affecting subjective player responses, this experiment will allow quantitative rather than qualitative feedback on the force reduction each type of foam provides. Challenge: Incorporate the arts into STEM education. Challenge: Create an enhanced STEM learning environment that brings together special education and AP students. Solution: Keeping in mind the diversity of their students, Special Education science teacher Sherrie Chovanec and science teacher Peter Fischer decided to put their heads together (and their classes) to create an enhanced STEM learning environment. They developed a student-centered learning program that includes hands-on experiences, data collection, and analysis with lots of interactive visualization. In their physical science labs, the AP Physics students have become peer teachers for students with Mild Intellectual Disabilities (MID). They work together to learn physical science concepts through inquiry-based labs, collecting data with sensors, and interpreting and analyzing the data using tools like PASCO’s SPARK Science Learning System. The resulting project was awarded the PASCO’s 2012 STEM Educator Award. • Students are spending less time learning science in many states, several states set a very low standard for proficiency in eighth grade science, and many students don’t have access to rigorous STE M courses. • In almost every state, children will get less time for science in elementary school than they did 15-20 years ago. • Sixteen states were unable to supply critical information on how much they have to pay to educate students twice on the same content— once during K-12 and once after high school. • At a time when job demand in most states exceeds job growth, CTEq has found that job openings nationwide in STE M fields outpace the number of qualified applicants two-to-one.